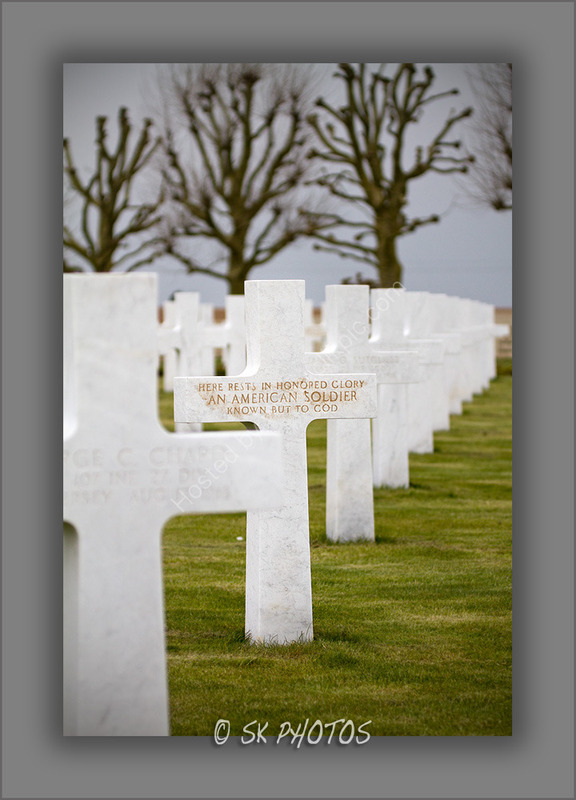 SK Photos: Somme American Cemetery. The Somme American Cemetery and Memorial in France is sited in the commune of Bony, on a gentle slope typical of the open, rolling Picardy countryside, in northern France. The 14.3-acre cemetery contains the graves of 1,844 of the United States' military dead from World War I. The headstones, set in regular rows, are separated into four plots by paths that intersect at the flagpole near the top of the slope. The longer axis leads to the chapel at the eastern end of the cemetery. A massive bronze door surmounted by an American eagle leads into the chapel, whose outer walls contain sculptured pieces of military equipment. Once inside, light from a cross-shaped crystal window above the marble altar bathes the subdued interior with light. The walls bear the names of 333 of the missing.